Here are just some of the techniques that can be used to get the most out of your garlic for the particular purpose you may be intending it for. The best place to store garlic is in a dry, warmish environment. Hanging in the kitchen as a plait or grappe or on the kitchen windowsill is fine. Never put dry garlic in the fridge as it is cold and damp. This will cause it to behave as if in the ground and start to shoot. The exception is green or wet garlic which may have been harvested slightly early to give a fresh zingy flavour. This should be eaten within one or two weeks and hence storing in the fridge will keep that freshness a little longer. 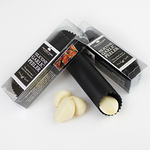 Crushing garlic with a garlic press or pestle and mortar gives the most pungent taste. 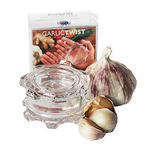 We also highly recommend the Garlic Twist as an effective way of mincing garlic. 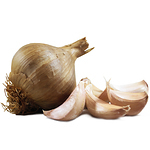 By completely breaking down all the cells within the clove, creating the maximum reaction of allinase with sulphur compounds, we can fully explore the potential complexity of flavour of the garlic. Crushed garlic is not only the best way to get a strong flavour but alsogives the most health benefits, provided it is not cooked. Heat and acid will inactivate theenzyme allinase which helps create allicin although there are many other beneficial compounds which survive the cooking process. Leave your crushed garlic to stand for 10 - 20 seconds to maximise flavour and health benefits before putting it to use. 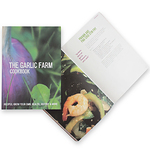 Natasha is the daughter of Colin, the Garlic Farmer and her book gives in-depth info on garlic and it’s healing properties accompanied by recipes that allow you to get the most health benefits from the bulb. Peeling garlic can be a slightly daunting affair but here are a few basic tips to make it easier. Using the flat of a large knife push down on a clove until you hear it crack. All of the skin can then be peeled away relatively easily.If you want the whole clove to remain intact then the little rubber peeling tubes are the best solution and you don’t end up with garlic on your hands or under the fingernails!If you have a high quality garlic press you can may be able to simply crush unpeeled cloves straight into your cooking or onto a chopping board. If you’re frying your garlic in oil or adding it to a stir fry then these methods can work well to give that rich, sweet and nutty flavour. 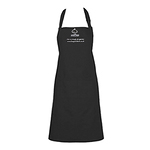 By chopping, the chemical reaction in the garlic is not activated fully so will give a milder flavour than crushing. Sliced garlic can give a goodvisual effect if you’re adding it to sautéed vegetables or in a salad. Lightly salting the garlic can also enhance its flavour. 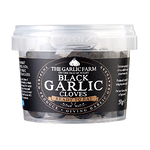 Whatever you do though, don’t cook the garlic until it is anywhere near dark brown or burn it as the flavour will then be quite unpleasant. When garlic is cooked as whole cloves, no chemical reaction takes place to create allicin orother sulphur compounds so the flavour of the garlic will be much milder and quite different to crushed garlic. Roasting garlic whole with skins intact gives a wonderful mild, sweet,caramelised taste.